Ever since the Blendablities, I've been waiting for a new line of alcohol markers from Stampin' Up!, and I believe we've hit the jackpot with our new Stampin' Blends line. 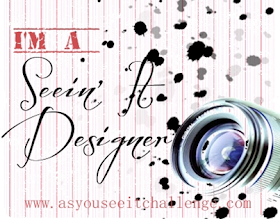 They are very user-friendly and affordable. There is a selection of 12 colours with 2 shades of each - light and dark, plus skin tones Ivory and Bronze, and a Colour Lifter. 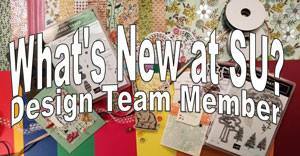 You can buy them singly for $6.00 each or in a combo pack of both shades for $12.00. Or you can buy all 27 markers for $162.00. 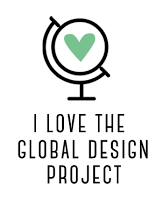 I've been very happy with mine so far, and would encourage you to give them a try. 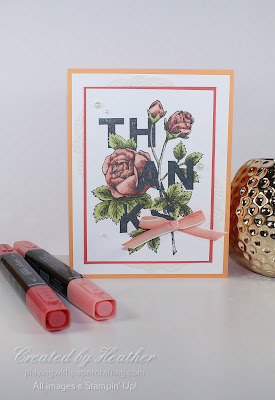 This month's Technique Classes are all about learning to colour with the Stampin' Blends and the card I want to share with you today is one of the projects we are going to work on. I wanted to use an image for the class that was large enough to really get some good shading practice in, but not so large as to be intimidating and time-consuming. 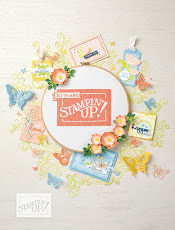 I decided to use the Floral Statements stamp set from the Annual Catalogue. 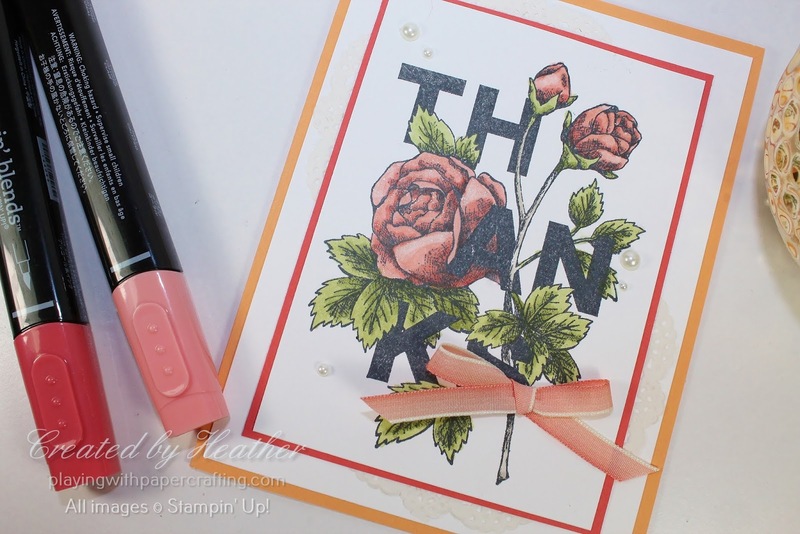 It has a few large areas, without being overwhelming, plus a lot of shading is already included on the stamped image to help you to know where to place the shadows. 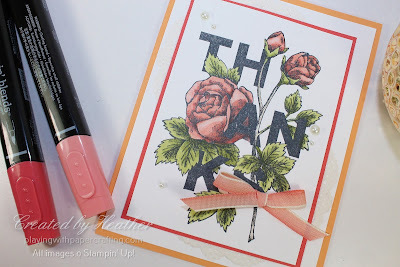 I stamped the image in Tuxedo Black Memento Ink, so it wouldn't run when touched by the Stampin' Blends markers. Along with a card base of Peekaboo Peach and a backing of Calypso Coral, the Whisper White panels are also backed with a Delicate White Doily, cut in half and strategically located, and adorned with a Calypso Coral ombre ribbon, tied in a bow. The images were coloured with the two shades of Calypso Coral and Old Olive and a layer of Wink of Stella was added to the blossoms. A few scattered Pearls finish the look. 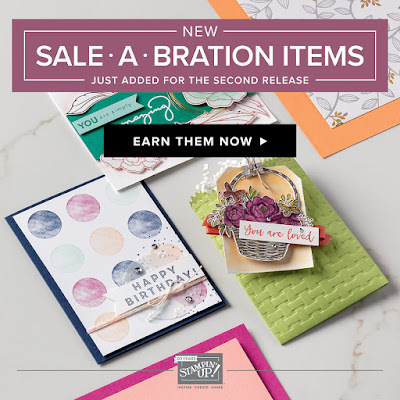 Sale-A-Bration continues and by the end of this week, you will be able to earn the second release Sale-A-Bration Rewards, as well as the first release items, with every $60 spent. 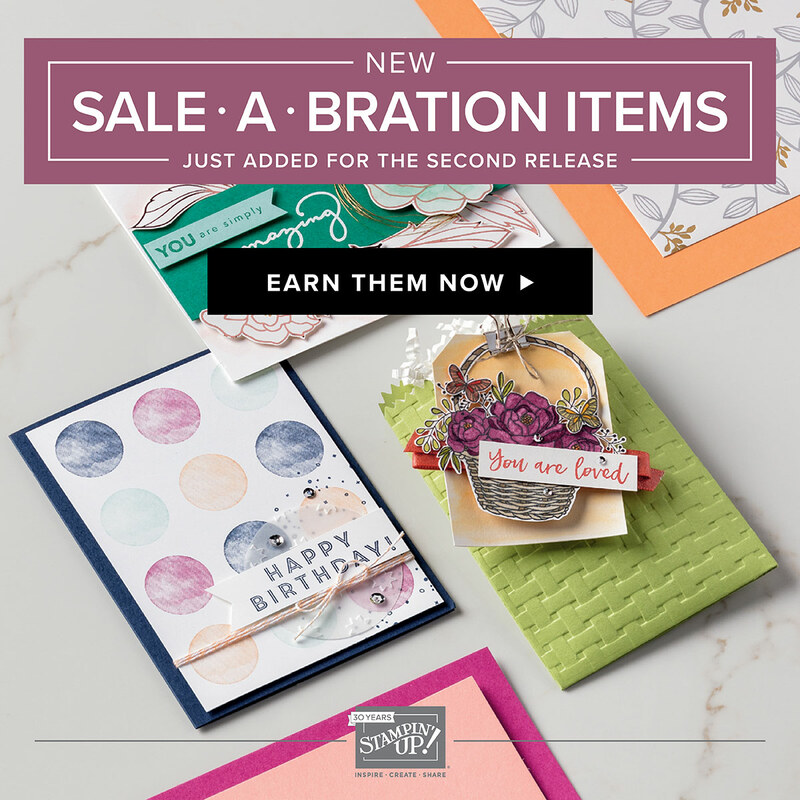 Don't forget that you will also earn an invitation to my Celebrate Sale-A-Bration Party in April! 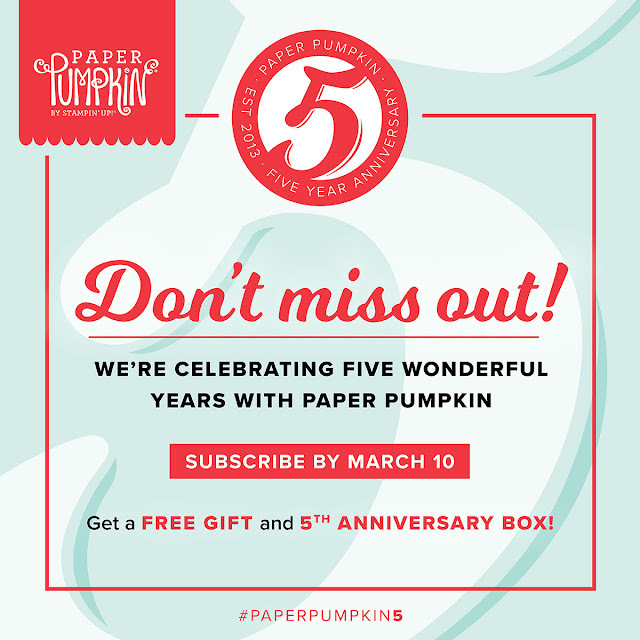 Also, we've learned that Paper Pumpkin turns 5 this year and to celebrate, Paper Pumpkin will be including a free gift for all subscribers in a special 5th Anniversary Box for your March project kit. To make sure you are in on this, make sure you're subscribed or resubscribed by March 10, 2018.